Who knew there were so many options for when your baby has outgrown the sink, baby bath, or (in many twin cases) the laundry basket? 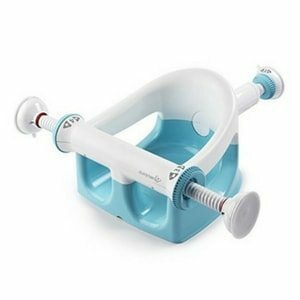 Summer Infant has come out with a new infant bath seat called “My Bath Seat”, which has many features, and they were generous enough to send us a seat to test out. 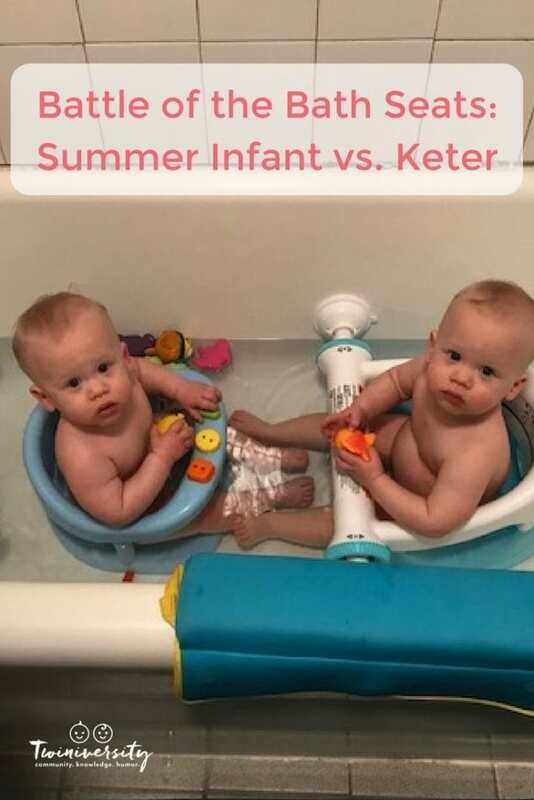 Armed with 1 bath seat I decided to take it upon myself to find something else for my other twin, which brought me to find two Keter bath ring seats on the twin resale market. Let the battle of the bath seats begin! All opinions are my own and photos are of my own twinnies. So here is how I set it up. I measured out the bath seats and put one down, marked where it ended, and then did the same on the other side. Admittedly, I did not initially think that two My Bath Seats could actually fit in the tub at one side. But with careful maneuvering and a bit of a tight fit, I believe two could fit simultaneously. 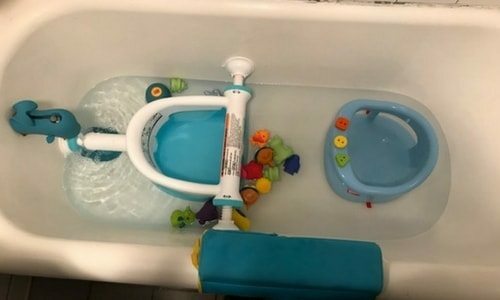 Also, I have read from other twin moms that they removed the back arm of the Summer Infant seat to fit two in the same tub, but I feel that affects the integrity and safety of the seat. But, as a twin parent, I totally know we sometimes have to improvise to get what we need and what works for our family. Something to note is that I have an old porcelain tub that is standard sized. A non-stick tub is not recommended by the manufacturers. My Bath Seat by the drain and the faucet. Keter on the opposite side. 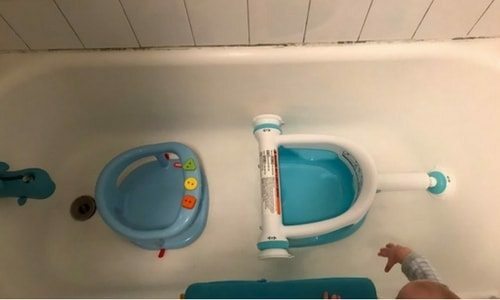 The first thing I noticed was that you need to follow the numbering system on the My Bath Seat or else you are not going to get it stuck to the sides properly. The instructions are very easy to follow. It was a bit strange maneuvering it in with the faucet and drain, but it was very sturdy. The Keter was smaller and fit nicely in the other side of the tub. There are little toys on the Keter that my boys are fascinated with. The My Bath Seat was grounded down and prevented the fellas from twisting and turning around. The Keter they have a bit of movement which allowed them to see more around the tub. My Bath Seat in the back and Keter by the faucet. This was tight! Because of how far the My Bath Seat came into the middle, and not wanting to put the other fella over the drain, the kids were leg to leg. Still, the My Bath Seat was very sturdy and the fella close to the faucet could totally reach around and try to twist his little self out. Round 2 to My Bath Seat. Push the seat down and pull tabs to release suction cups. After all of my testing, I am calling this battle a draw. I think the My Bath Seat is great, but I do not necessarily think it is great for our twinnies. It is really a tight fit and to put two in the tub at once I would have to compromise the design of the seat. The Keter is also great. It’s compact and simple. If you are in the market for a bath seat, you can feel good about putting your twinnies in either product and know that they are safe and secure while you have bath time fun. And why not buy one of each to have some variety? Jenifer Roth is a busy, busy mom to 1-year-old identical twin boys Jase and Evan, full-time High School driver ed teacher, and full-time finder of random information to help others! When not running around from work to home to errands she enjoys working on her blog, making piles of stuff and just hanging with her family! Trying to find the work-life balance has been a journey of its own but push on she must! You can read her blog here! 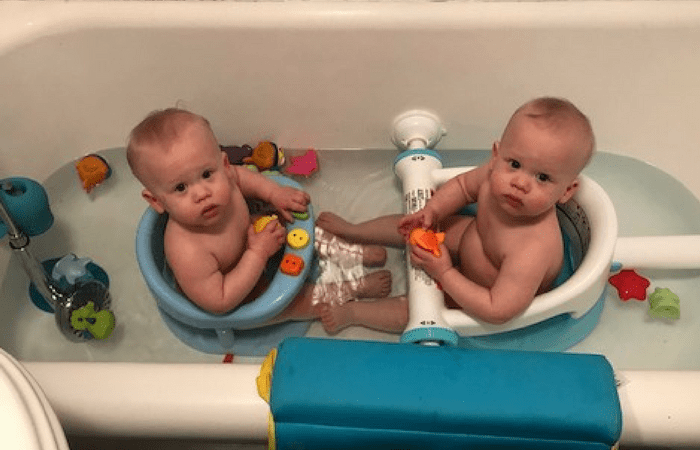 Can I Give My Twins a Bath Together?